We have at our disposal today about thirty documents on the relations between Josef Mysliveèek and Wolfgang Amadeus Mozart; from these we learn about their first encounter, their mutual respect as artists, and the sincere friendship, which despite various twists and turns lasted until Mysliveèek’s death. An important but not always positive role in their contacts was played by Wolfgang’s father Leopold, who was a severe judge of Mysliveèek’s behaviour. In good faith that he was protecting his son from bad examples and promoting his interests, he never forgot pragmatic aspects and tried to regulate his son’s relationship to the Czech composer through his advice. This was however many times in sharp contrast with the purely positive feelings his son had for his older colleague. Josef Mysliveèek (in various sources also referred to as Bisliweck, Melsiwesech, Misliwetschek, Metzlevisic, Mislivicheck, Misliwecek, Misliweczek, Misliwetzek, Venatorini), also known as ‘Il Boemo,’ (i.e., the Czech) was one of the most talented composers of the second half of the eighteenth century. In his day he was one of the most successful and universally acclaimed composers. In addition to his transient popularity, his scores feature numerous passages bearing the hallmark of genius. According to his Florence obituary (17 February 1781), ‘He was a guest in almost all the courts of Europe, where his abilities received great compliments, and he was on terms of friendship with the greatest personalities.’ Aside from the permanent interest in his instrumental music, particularly in German-speaking countries starting in 1764, he experienced what was for a foreigner a dizzying career in Italy as an opera and oratorio composer (‘Maestro Compositore’) and even against strong competition was one of the most sought-after composers in the leading opera houses. He was born on 9 March 1737 in Sovovy Mlýny No. 503, Kampa, Prague. His father, Matìj Mysliveèek, was a miller and a member of the Union of Provincial Sworn Millers. Josef spent his childhood in the vicinity of the mills of Kampa and the Staromìstská Lávka near Charles Bridge. After completing his trivia with the Dominicans at St. Giles, some uncompleted studies at the Jesuit gymnasium where he did poorly in logic (‘nihil profecit in logica’), and private studies in hydraulics with Professor Jan Ferdinand Schor, he entered an apprenticeship with Václav Klika, a miller in Prague’s Old Town. Together with his brother he was admitted to the guild in 1758, and later they were both pronounced masters. Already in 1749, however, Mysliveèek was widely recognized as a ‘skilled violinist.’ In 1760 he began studies in counterpoint with František Habermann, but as his contemporary F. M. Pelcl notes, ‘he [Habermann] apparently proceeded too slowly for him,’ so that after a year he found a new teacher in Josef Seeger. After only six months of study with Seeger, he was composing symphonies, and six of them were anonymously performed probably in the Wallenstein Palace with programme titles of the first six months of the year: Januarius, Februarius, Martius, Aprilis, Maius and Junius. It was here that he found a patron, a lover of music, Count Vincent Wallenstein (Waldstein). Under the influence of Prague’s opera and oratorio scene, however, he felt especially attracted to musical drama. The dedication and subsequent performance of the cantata Il Parnasso confuso as well as of a number of independent sacred arias are proof of Mysliveèek’s ongoing relations with the Cistercians in Osek and the Benedictines in Bøevnov in Prague, who also provided him with a loan of 3,000 florins to go on a study trip to Italy. After the success of these early works in 1763, he left for Italy, where he wanted to improve his opera skills with the Venetian maestro G. B. Pescetti. Italy became a second home for him. In Venice he stayed with Pescetti at most for 17 months. Mysliveèek’s subsequent stay in Parma in 1764 is not documented, nor is his first opera which he (according to the historian Pelcl) wrote in that city. It is not entirely clear which opera was accompanied by the ‘most favourable reports’ so that it caught the attention of Amadori, the impresario of Naples: was it the reprise of the cantata Il Parnasso confuso (1665-1667) or the opera Semiramide riconosciuta in Bergamo in 1765, or perhaps in Alessandria in 1766? He entered the peak decade of his career (1767–1777) with the premiere of his opera Bellerofonte in the Teatro San Carlo (20 January 1767) with the renowned soloists Anton Raaf and Caterina Gabrielli. The Florentine newspaper Notizie del mondo often referred to Mysliveèek’s premieres as exceptional in the response they received (‘grandissimo incontro’); they were mostly performed together with unrelated ballets by composers, dancers, and choreographers Carlo le Picq and Onorat Viganó. But despite his repeated success in Naples, Turin, Prague, Padua, Venice, Bologna, Florence, Milan, and Pavia, he was constantly tormented by lack of money, loans, and difficulties with creditors. The turning point in his career and the beginning of his gradual fall to the depths of society came early in 1777 when he travelled to Munich, and his carriage overturned with him. His open wound became infected, and he was forced to spend a year in hospital, from which he was released in the spring of 1778 with a disfigured face. Some sources however suggest that the actual reason for his disfigurement was a venereal disease (syphilis). He died impoverished and destitute in his home in Rome on 4 February 1781. Their next meeting took place in Milan, where Mysliveèek arrived in November 1771 because of a commission for his opera Il gran Tamerlano (opening on 26 December 1771). Although he had only slightly more than a month to compose and prepare the opera, he did not hesitate to visit both Mozarts the second day after his arrival. Almost a year later Wolfgang wrote from Milan again: ‘Mr Mysliveèek is still here,’ but this time he did not mention him explicitly among their ‘good friends.’ The three letters by the two Mozarts from January 1773 also include Mysliveèek’s greetings and the famous compliment to Wolfgang’s sister, ‘Maestro Mysliveèek kisses Nannerl’s virtuosic hands.’ Wolfgang’s inscription on the letter from Vienna, written and sent home on 9 September 1773, jokingly alludes to Mysliveèek by using the general-bass score of his Concerto per violino obligato e stromenti for under padding. Then there is a four-year gap in the documentation of the relations between Mysliveèek and the Mozarts, followed by a sharp turn. Wolfgang Amadeus arrived in Munich on 24 September 1777 together with his mother during another of their European tours; at that time Mysliveèek was there too, as a patient in the ducal hospital. All the while he was composing and overlooking the preparations for a performance of the second version of his oratorio Abramo ed Isacco. The presence of the two old friends in the same town led to a stormy exchange of letters between Munich and Salzburg. Mysliveèek knew nothing about Wolfgang’s arrival, just as Wolfgang knew nothing about Mysliveèek’s sojourn in Munich. Mozart the father, however, must have know from correspondence or from hearsay about Mysliveèek’s being there in the hospital, and it was indeed he, who first put into words suspicions of venereal disease. This was why Leopold decided to thwart the meeting at all costs and advised Wolfgang, in case Mysliveèek found about his presence in Munich, to explain that his mother was opposed to their meeting; he would have to understand that. Finally Leopold harshly condemned Mysliveèek’s despicable lifestyle, which caused him shame before the whole world, and blamed him as responsible for his own suffering. Starting with this sharp statement, Leopold’s relationship to Mysliveèek can no longer be called friendly since all their mutual contact from that time on concerns exclusively business and tactical moves. Mysliveèek’s carnival opera Il Gran Tamerlano, which premiered on 26 December 1771 in the Teatro Regio Ducal of Milan, is one of the highlights of the first period of his opera writing. This period was characterized by the use of the three-part ‘dal segno’ aria form. Arias in this from were introduced by an orchestral prelude presenting the main thematic material which was subsequently developed in the vocal line (part A) and then followed by a contrasting section (part B), the contrast being e.g. a change in key (minor vs. major), a change in the tempo (fast vs. slow), a change in the character of the orchestra accompaniment and/or instrumentation (full orchestra vs. strings); then part A returned in abbreviated form. The abbreviation consisted mainly in omitting the introductory orchestral section but sometimes also some of the singing in order to increase the dramatic momentum (as opposed to the original ‘da capo’ arias, in which literally everything was repeated), but at the same time left the interpreters with sufficient room to improvise their own fioritura in the repeated part and with their art thus try to win the favour of the audience. Both arias of sultan’s daughter Asteria were written precisely in this form. The first of them, the aria from the first act ‘Sento nell alma mia’, is an aria in which Asteria expresses her hatred for Tamerlan, who longs for her and desires immensely to win her heart. The storm of emotions in which she finds herself is expressed through virtuoso coloratura and like most of Mysliveèek’s arias makes enormous technical demand of the artist. At the same time it offers beautiful melodic material, which in itself is however so diverse and distinctive that it would definitely suffice to build a sonata allegro. The aria from the second act of the opera, ‘Nacqui in seno alla sventura’ is a moving utterance from Asteria’s sorely tried soul. The simple and poignant music is enhanced by soft string accompaniment, supported by just two flutes. The premiere of the opera Il gran Tamerlano was highly successful, and it eventually became one of the most popular operas performed in Milan at that time. Direct proof of its popularity are the many contemporary copies of arias and duets. Mozart’s opera Lucio Silla also premiered in the Teatro Regio Ducal. It was performed with ‘moderate success’ exactly a year after Mysliveèek’s Tamerlan. It is likely that its more lukewarm reception was influenced by the many complications that accompanied its preparation. The singers, according to whose capabilities and desires the composer had to write the arias, were often late for rehearsals; to top it off, the first tenor fell ill, and a replacement for him had to be found at the last moment. Here too the sixteen-year-old Mozart was writing an opera for the composition of which he only had six weeks. The aria ‘Se il crudel periglio’ is sung by the main character Giunia, tormented by her deadly fear for the life of her fiancé, Cecilio. She asks their mutual friend Cinna to look after Cecilio and protect him from the despotic tyrant Silla in case he should try to kill him again. This aria falls into the category of the ‘aria di bravura,’ i.e., extremely virtuoso arias; in view of the fact that the prima donna who premiered in the opera, Anna de Amicis-Buonsolazzi, was delighted by how perfectly Mozart had written for her voice, she must have been an extremely technically capable singer because to this day this aria is one of the touchstones for all coloratura sopranos. Its length, its vocal range (up to a high D) and its overall demands on mobility of the voice and coloratura make it one of the absolutely extraordinary creations even in the context of Mozart’s work. The opera Artaserse was first performed in the Teatro San Carlo in Naples on 13 August 1774 on the occasion of the birthday of Queen Maria Carolina of Naples. Mysliveèek was awarded this contract based on the success of his opera Romolo ed Ersilia, which had been performed for the Queen’s birthday the year before. In the second act of the opera, Artabano, prefect of the Royal Guard, condemns his son to death, for which deed he is universally hated, most of all by Mandane, who up until that time had been so loudly calling for justice. At the most highly-charged moment when open conflict breaks out between Mandane and Artabano, Mandane sings an aria of wrath (‘aria di furore’) ‘Va tra le selve ircane,’ in which from the depths of her heart she pours out all her hatred for Artabano. The aria was written in G minor, and its ferocity perfectly matches the dramatic potential of the libretto. Since this opera already belongs to the composer’s second period when he was gradually abandoning the form of the ‘aria dal segno’ and developing the sonata type with ritornellos, this aria too is composed according to the sonata form. Mozart’s ‘dramma giocoso’ La finta giardiniera, which premiered on 13 January 1775 in the Salvatortheater in Munich, returns after the success of his ‘opera seria’ in Milan to ‘opera buffa’, or rather to a transitional type. Although La finta giardiniera is usually not ranked among Mozart’s greatest operas, it is a major milestone in his musical-dramatic oeuvre. Here for the first time he created a model which he later used in all his famous operas, i.e., a blending of comic elements and serious motives and ideas, mixing the elements of ‘opera buffa’ and ‘opera seria’. Here Mozart strives for individual characterization in music and works inventively in his instrumentation. It is in particular the character of Marquise Violante Onesti, who assumes the false identity of the gardener Sandrina, who represents the so called ‘mezzo carattere’ and has a number of moving arias in the serious vein. ‘Geme la tortorella’ is one of the most interesting and emotional arias in this opera. The vocal line, following a line of perfect aristocratic elegance, soars high above the crystal clear accompaniment of the string ensemble of muted violins and pizzicati on the violas, cellos, and double basses. The opera Medonte, re di Epiro first opened in the Teatro Argentina (Teatro a Torre Argentina) in Rome on 26 January 1780. All the artists performing were men because women were not allowed as actresses on stage in Rome until the arrival of Pope Pius VII in 1800. For a long time, Mysliveèek scholars erroneously held this work to be his last, and its premiere was termed incorrectly a failure. It has become clear, however, that the objections were levelled against the changes made in Metastasio’s libretto and not against Mysliveèek’s music since immediately after the premiere he obtained another contract in Rome. A dramatic highlight of this opera is Seléné’s accompanied recitative and aria ‘Dove, ahi dove son io?... Adorata mia speranza,’ which the poor princess of Argo sings in a dungeon, where she has been thrown by Medonte and where he intends to have her walled up alive. Here we can no longer speak of a recitative and an aria: it is a thoroughly through-composed scene, in which the accompanied recitative, replete with invention, passes over into an aria from which the music then emerges out into another dramatically impressive recitative, reflecting with incredible efficiency the extreme situation which Seléné is experiencing and the feelings it evokes. These burn her like the fires of hell; she freezes with terror at her approaching death; in anguish she calls her beloved Arsace, asking him to help her, and at the conclusion of this drastic scene she asks her enemies to put an end to her suffering. 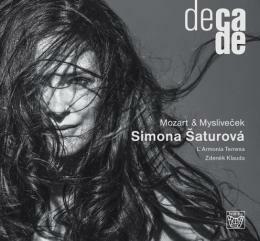 The music through which Mysliveèek creates this picture goes beyond the norms of his day, exceptional even for his own standards of composition and completely passing beyond the limits of the ‘opera seria’ genre so that it moves out towards Gluck’s reforms and the style achieved later by Mozart in for example his Idomeneo. Just a few days before Mysliveèek’s death in 1781, Mozart premiered his opera Idomeneo at the behest of the elector of Munich. The story of a Trojan woman imprisoned in Crete has a happy ending in her marriage to the king’s son Idamante, who is rescued from death by a deus ex machina. Mozart’s ‘dramma per musica’ is strongly influenced by French opera with its dramatic participation of choruses. In the second act of this opera, Ilia in her aria ‘Se il padre perdei’ tries to explain her relationship to Idomeneo, who had just revealed her feelings for her. Whereas he loves her as a woman and proposes marriage to her, she sees him as a replacement for her lost father. In her aria, she proclaims her pure and innocent love for him, which Mozart expressed through a chaste melody and a fine mesh of string instruments (muted violins – con sordino) and solo wind instruments (flute, oboe, bassoon, and horn). When eventually in the third act Idamante arrives on stage to be sacrificed to Neptune, Ilia decides to declare her love for him openly. Idomeneo and Elektra find them together, and Idomeneo – still unable to reveal his true motives – orders his son to leave Crete instantly. Idamante refuses, and each of the two separately experience and express their feelings of despair and horror. Mozart set this moment to music in what was for his day an unprecedented and original quartet, ‘Andro ramingo, e solo.’ The music is full of surprising harmonic progressions and onomatopoeic passages and contrasts which correspond to the mixed emotions of all the characters involved.